The holidays are a fun time. You get to spend time with friends and family, do some dorm room decorating, and buy fun and amazing presents for your friends and family. When you're thinking about all those things, there's probably a lot on your mind. What do you get your mom and dad? How should you do some dorm decorating? And most importantly, how do you dorm decorate without losing space in your college dorm room! Believe it or not, our 23' Burgundy Glitter Ribbon can help you with a few of those things! 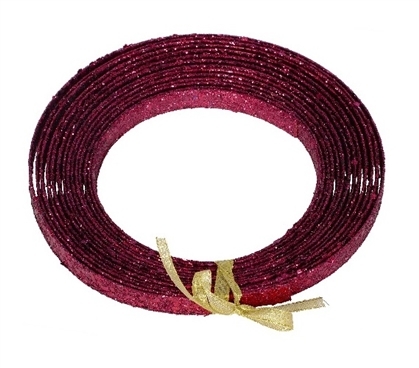 Our Burgundy Glitter Ribbon is a thicker, sturdier ribbon that is flecked with burgundy glitter. The sturdiness of this dorm essentials item makes it ideal for both dorm room decorations and wrapping gifts. Your mom and dad will be so happy with the thoughtful accent of a bow of Burgundy Glitter Ribbon on their gift! You can even wrap this dorm essentials item around your dorm Christmas tree for extra color and style on the branches. Whether you choose to wrap this college supplies item around your dorm desk, wreath, or Christmas tree, you can rest assured you will have a well decorated dorm room for the holiday season!